The aFe Stage 2 Cold Air Intake with Pro 5R filter for the EcoDeisel equipped 2014 WK2 outflows the factory intake system by 29% for maximum performance gains to the tune of 7hp and 8ft. lbs of torque. This intake utilizes a highly engineered one-piece heat-shield that is designed to reuse factory mounting locations for ease of installation with no drilling or cutting. Large 9" x 6-1/2" diameter x 5-3/8" Tall Filter with a 3-1/4" flange opening provides 28% greater airflow over the stock intake system. This washable/reusable 5-layer progressively finer mesh cotton gauze oiled media air filter provides maximum airflow for increased horsepower and torque. Constant 3" diameter Mandrel-Bent Black Powder-Coated Intake Tube For Better Heat Insulation and volumetric efficiency. 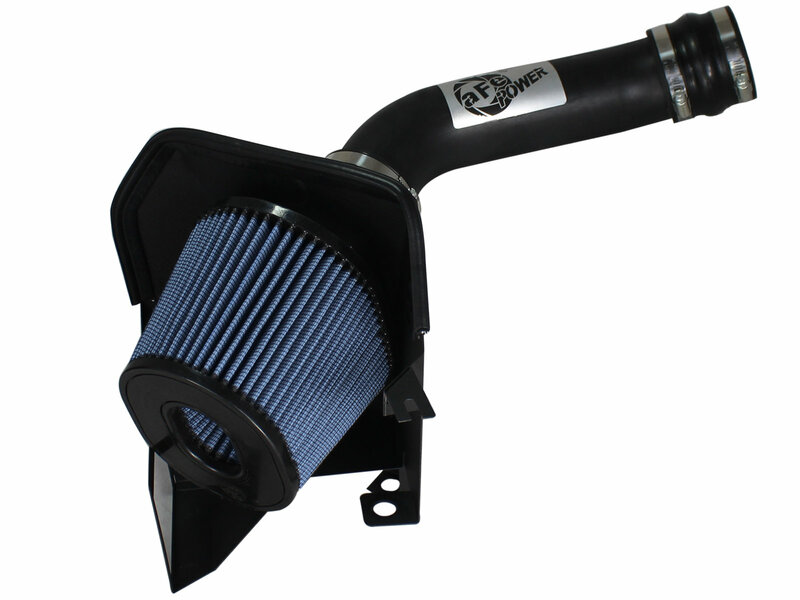 Sturdy 16 Gauge Powder-Coated One-Piece Heat Shield blocks engine heat and includes bracket for stock scoop to direct cool air directly to the filter. The factory MAF sensor is mounted on the housing to ensure OBD2 compliance without CEL errors. All clamps, couplings, and hardware are included for hassle-free installation. This is a direct bolt-on kit that requires no cutting or drilling on OEM parts.